Flotilla Holidays – What experience will you need? It is wise to have some experience in practical sailing when undertaking a flotilla charter and preferably to have skippered a boat before. Even on a charter holiday the skipper of a boat is wholly responsible for the safety of the boat and, most importantly, that of the people on board. Basic navigation, pilotage, boat handling and seamanship ability are necessary to be able to take charge of a boat safely. In terms of RYA courses, Day Skipper Practical is the entry-level skippering course. Some companies will specify particular qualifications that they want people booking flotilla holidays to have, therefore check the brochure carefully before you book. 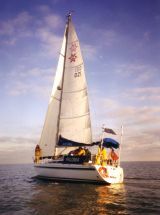 Flotilla holidays are the ‘middle’ option for someone who has practical sailing and skippering experience, but lacks the confidence to go it alone completely. A flotilla charter has the benefit of immediate advice and support should problems arise, but individuals are still expected to be able to skipper and sail their boat to a safe standard. A bare-boat charter is the most independent type of sailing holiday and anyone intending to undertake such a holiday must be confident enough in their sailing ability to handle any of the conditions that they might expect to meet in the area in which they will be sailing. The charter company may specify qualifications. Someone hoping to bare-boat charter should have a good grounding in offshore and coastal navigation as well as passage planning. They should be competent in pilotage and meteorology, and have good boat handling skills. In qualifications terms this is at least Day Skipper Practical standard, but edging more towards Coastal Skipper standard.